This adapted excerpt is republished with permission of the publishers—NYU Press—from the upcoming book Muslim Cool: Race, Religion and Hip Hop in the United States, by Su’ad Abdul Khabeer. – Eds. Esperanza is a single mother in her early thirties. She is a Latina multimedia artist who loves to teach but also teaches to pay the bills. I met up with her at her home in Humboldt Park in Chicago and after she let her kids know “we handling important business here,” we lounged and she shared her reflections on being raced, gendered, classed, and Muslim. I had seen Esperanza at hip hop cultural events around the city before we formally met at the Inner-City Muslim Action Network (IMAN). IMAN is a Muslim-run nonprofit that provides services, community organizing, and arts-based activism on the southwest side of Chicago. IMAN was a key site for me in the field just as it was a place of central importance for many of my interlocutors, who I refer to as my “teachers” because I drew on their generous sharing of their knowledge and experiences. My teachers, US Black, Latin@, Arab, and South Asian American Muslims engaged in hip hop–based activism, are the progenitors of a discourse, an epistemology, an aesthetic, and an embodiment that I call “Muslim Cool.” Forged at the intersection of Islam and hip hop, Muslim Cool is a way of being Muslim that draws on Blackness to contest two overlapping systems of racial norms: the hegemonic ethnoreligious norms of Arab and South Asian US American Muslim communities on the one hand, and White American normativity on the other. Esperanza wore camouflage because she liked it but also because racialized systemic inequalities had shut her family out of economic opportunity and shuttled her brother into “the service.” In contrast, the “Pakistani girl” who thought the camouflage was cool had access to a set of class-based and cultural privileges—she was educated and suburban and had more cultural authenticity as a Muslim. Accordingly, the Pakistani girl’s potential appropriation of camouflage was embedded in unequal power relations: Esperanza loved the girl and the girl loved her scarf but, as Esperanza put it, all that love was fraught, “no matter how much Islam we have in common.” Yet, the camouflage-loving Pakistani girl was not merely a cultural interloper; she was also a racialized and gendered Muslim subject navigating her identity at the crossroads of hip hop and Islam. The Pakistani girl in Esperanza’s story reminded me of Rabia, a young Pakistani US Ameri­can woman who was also one of my key teachers in the field. I could imagine Rabia admiring Esperanza’s scarf with the same kind of unbridled enthusiasm, but in contrast to the first “Pakistani girl,” Rabia was an activist who worked in Englewood, a predominately Black neighborhood in Chicago. For Esperanza, Rabia was different because “the struggle” was not just a fashion accessory for her. However, she noted insightfully that this did not mean that Rabia, she, or any of us could escape the complex realities of race, identity, and power in the fight to contest hegemonies and overcome inequality. This insight is critical to understanding Muslim Cool: at the meeting of Islam and hip hop, intersecting notions of Muslimness and Blackness challenge and reconstitute the racial order of the United States. I make three central arguments in this book. First, I argue that Black­ness is central to the histories, engagements, entanglements, and experiences of US American Islam. The term “Blackness” in my work refers both to the histories, traditions, and customs of Black peoples and to the circulating ideas and beliefs about people of African descent. My rendering of Blackness is Diasporic (Hall 1990) and polycultural (Kelley 1999) and as such conceptualizes Blackness as culture and discourse, which relies on and exceeds the body, Black and otherwise. I contend that Blackness shapes the individual Muslim experience in the United States and interethnic Muslim relationships as well as the terms of US Muslim engagement with the state. Second, I make a case for the continuing significance of race and Blackness in the contemporary United States. The book focuses on interminority relationships to articulate a narrative of race and racism in the United States that transcends the Black-White binary and also the fallacy of postracialism, which holds that racism, particularly anti-Black racism, is over and that any talk of race is actually counterproductive to the work of antiracism. I identify the ways in which race, and specifically Blackness, is marshaled in the work of antiracism. For Muslim Cool, Blackness is a point of opposition to white supremacy that creates solidarities among differently racial­ized and marginalized groups in order to dismantle overarching racial hierarchies. Yet as the stories in this book illustrate, these solidarities are necessarily entangled in the contradictions inherent in Blackness as something that is both desired and devalued. The engagement with Blackness by young US Muslims, Black and non-Black, is informed by long-standing discourses of anti-Blackness as well as the more current co-optation of Blackness in the narratives of United States multiculturalism and American exceptionalism. Accordingly, my third central argument is that any analysis of contemporary Blackness must contend both with the ways in which it is used to resist the logics of white supremacy and with its complicity in that supremacy. There is a push and pull at the core of Muslim Cool that is grounded in its relationship to hip hop. Hip hop, as an artistic form—expressed in DJing, emceeing, dance, and graffiti—and as a form of knowledge and cultural production—from ideas and language to fashion and style—is a site of critical contradiction and con­testation. The contradictions and contestations of hip hop are often depicted through the homonyms “roots” and “routes”: hip hop is rooted in Af­rodiasporic expressive cultures and has traveled on routes far beyond its origins. To the pair of roots and routes, I add the loop. I take “loop” from the hip hop sampling technique in which a selected piece of music is looped to play over and over as part of the creation of a new piece of music. Whereas roots and routes extend and splinter into multiple pathways, the loop extends and returns, not in a closure but in a cypher, the communal and competitive space in which hip hop culture regenerates and develops. The loop is a metaphor for the linkages between Islam, hip hop, and Blackness in the twenty-first century that create Muslim Cool: Islam, as practiced in US Black American communities, shaped hip hop, which in turn shapes young twenty-first century Black and non-Black US Muslims who return to Blackness and Islam as a way of thinking and a way of being Muslim—as Muslim Cool. Like a looped musical sample defined by sonic repetition and variation, Muslim Cool is a site of critical continuity and change. 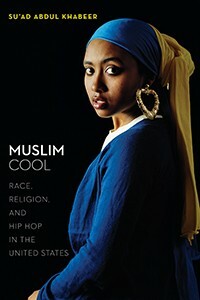 Muslim Cool traces the ways religious identity is constructed through hip hop and also documents the particular epis­temological impact of Islam and Muslim practice on hip hop music and culture. This impact, I contend, was fundamental to the development of hip hop ethics and activism. By demonstrating how the US American Muslim experience is entangled in the workings of race, religion, and gender in the contemporary United States, Muslim Cool avoids reifying Islam/West dichotomies. It does not cast Muslims as peripheral or as outsiders who navigate assimilation but rather as actors whose lives and experiences are critical to the production and reproduction of the contemporary United States and the “West” more broadly. Thus, Muslim Cool poses a direct challenge to the racialization of Muslims as foreign and as perpetual threats to the United States. It confronts the idea of a break with the past that is implied in readings of the contemporary moment as “postracial” and offers a more complex narrative of both the US Muslim experience and the meanings and performance of Blackness today. Accordingly, Muslim Cool is not a portrayal of a mul­tiethnic postracial utopia built through hip hop music. Rather, it prob­lematizes the ways Blackness is used in US American self-making as both a threat to America’s progress and a symbol of it. Muslim Cool is neither the story of a complete break with the past nor an easy tale of resistance but rather a charting of the powerful and dynamic ways in which Blackness and Muslimness merge to challenge and reconstitute United States racial hierarchies.